You are here : New York City Travel Tips » Before You Go » How to transfer between JFK airport and Manhattan? If you’re landing at JFK airport in New York, a number of transportation options are available to get to your hotel or apartment in Manhattan: take a cab, a shuttle bus, the subway, the bus and the limousine. It takes you from the airport to your hotel very quickly without having to walk. If you travelling with 2 other people, it’s the cheapest option. Not an economical option you’re travelling with one companion or alone. There is a $52 flat rate imposed since July 1st 2012 + tips. The cab driver can’t turn on his meter, but you’ll have to pay him $52. On the other hand, if 3 or 4 of you are travelling, they might not accept you in a cab, unless it’s taxi van. If you want to have a private transportation to your hotel or apartment, I recommend that you book this service with CarmelLimo. It's a reliable company providing an excellent service and at a good price. You may book your taxi before going to New York City. You'll be sure the taxi will be waiting for you, and this is the best solution to control your budget! They have 9 vehicles for 1 to 14 people: sedan, mini-van, SUV, limo. A private taxi for 1 to 4 people costs from $44, plus $12 for tolls and $7-8 for tips. Around $63 total price. To take your taxi, you have to get out the airport and go towards the Pick Up Area. Once outside the airport premises, you have to call the company at the phone number they gave you when you booked. In less than 5 minutes, your taxi will arrive with your name printed on a sign. - It takes you from the airport to your hotel very quickly without having to walk..
- CarmelLimo provides a private service for 1 to 14 people. - It picks you up on time. It's not an economical option you’re travelling with one companion or alone.. The second most practical option is the Taxi Shuttle. It takes you from the airport to your hotel without having to walk. The cost is $17 per person. Just like many things, if you want to prepare your trip the best way, book your shuttle right away. Because it’s one thing you won’t have to think twice and this will allow you to save cash for other expenses. Besides, you won’t have to pay money exchange fees since this reservation is paid in Euros from their website for those who are travelling from Europe. Your 3rd commute option are the Airtrain and the subway. The cheapest option, this will cost you around $7 and also the fastest in case of traffic on the road. A little longer than other options, it all depends of your hotel location. Besides, you’ll have to carry your luggage. An AirTrain card is available at $25 for 10 trips and can be used up to 4 people at the same time. So, if 3, 4 or 5 persons are traveling, it’s a great deal. After calculating, this will cost you $25 instead of 30, 40 or 50 dollars round trip. Your 4th solution is the bus from the company NYC Airporter. A little less expensive than the Taxi Shuttle since it costs $16 and $30 for a round-trip. Buses run around every 30 minutes. The company operates between JFK airport and Manhattan will leave you at Grand Central Station or Port Authority Bus Terminal or Penn Station. If your hotel or apartment is located far from these stops then you’ll have to continue the rest of your commute by bus or subway to get there. 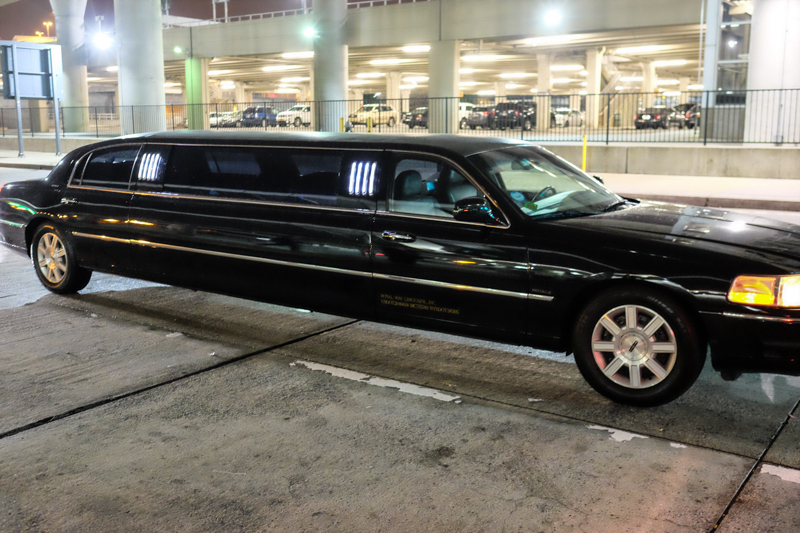 Do you know that you can rent a limo? I negotiated a friendly rate for you, it could be cheaper than you may expect! 11 responses to the post : " How to transfer between JFK airport and Manhattan? " We will arrive at 3:30 pm at JFK - what way of transportation would you recommend? ( just 2 persons including luggage) Our hotel is located on 41st Street near the UN building. Thank you - we are looking forward seeing NYC soon. It all depends on your budget. You can easily take the public transportation (Airtrain to Jamaica Station + subway E train to Lexington Ave. You may have to walk around 10 minutes to get to the hotel. In between 2 people, you can book a shared shuttle. I like to book a private taxi, I'm the only client, I don't have to wait for a taxi and I pay in advance. The private taxi fare will be a bit higher thatn the shuttle or yellow cab, but it's more comfortable too. The fastest option to Manhattan (and the cheapest) is to take the Airtrain direction Jamaica and then the E train. You'll stop at Port Authority Bus Terminal. It takes around an hour to make the transfer. You can buy a 10-trip ticket for the Airtrain for 4 people. It will cover the round trip from and to the airport. For a national flight, it's recommended to arrive 3 to 2 hours before the departure to the airport. I think you'll be on time if you leave Manhattan by 3 - 3:30pm. If you want to have someone waiting for you with a sign, you have to book with CarmelLimo. The hand luggage doesn't count, but you have to indicate you will have 3 luggage. It will cost you around $44 for you three, you just have to add gratuities. You have to book separately your way to Manhattan and from Manhattan. We need airport transfer from Newark International to the Millennium Broardway Hotel, Time Square. I'll recommend that you leave Manhattan by 3.30pm at last. There could be a lot of traffic and leaving earlier can avoid some unnecessary stress. If you want to make the transfer by public transportation, you will have to get to Penn Station, take the Amtrak and then the Airtrain. it's cheaper but a bit complicated if you're not so familiar with the trains + you have to carry your bags. Another solution is CarmelLimo, you can check the rates because it could be the best value (private car and better service). I found $51 for the two of you, one trip with CarmelLimo. With the shared van, one trip for one person costs $19,60. How do you want to make the trasnfer with a private taxi or a shared van?